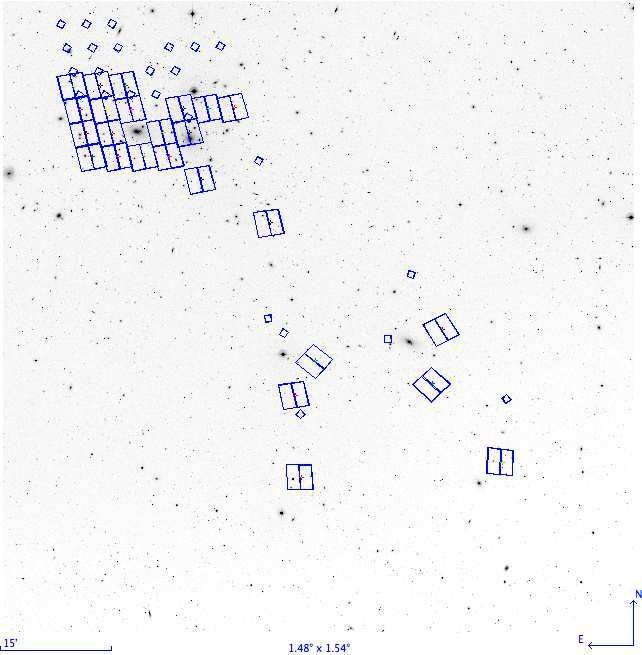 The HST ACS Coma cluster Treasury survey is a deep two-passband imaging survey of one of the nearest rich clusters of galaxies, the Coma cluster (Abell 1656). The PI of this program (HST Proposal number 10861) is David Carter. In addition to the MAST archive the data are also available through the Astro-WISE system, which also archives related data from the project obtained with different instruments. While HST data were obtained with both the ACS and NICMOS instruments, only the ACS data are included in the latest release. The survey was designed to cover an area of 740 square arcmin in regions of different density of both galaxies and intergalactic medium within the cluster. The ACS failure of January 27th 2007 leaves the survey 28% complete, with 21 ACS pointings (230 square arcmin) complete, and partial data for a further 4 pointings (44 square arcmin). Completion of the survey at the time of the ACS failure January 2007. Tiles shown have some or all of the proposed observaions completed as of this date. 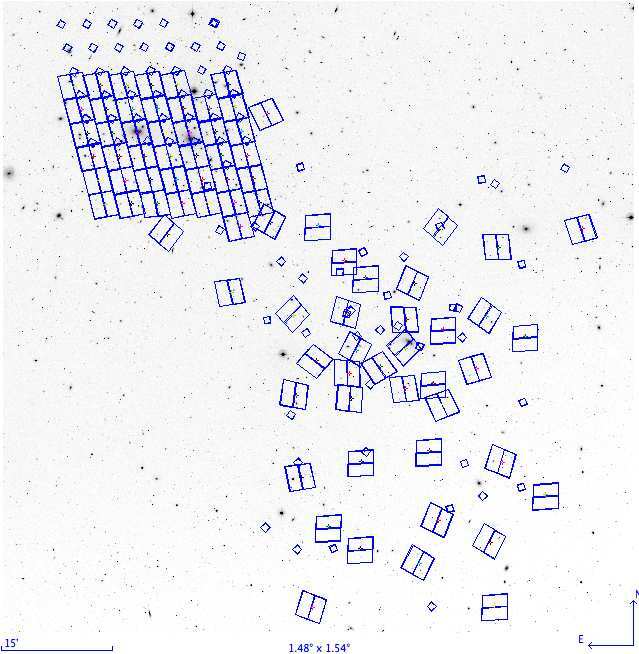 The small squares represent the NICMOS parallel exposures. Click to see the planned observations. Figures taken from ApJS June 2008. A detailed description of the pipeline is given in The Hubble Space Telescope Advanced Camera for Surveys Coma Cluter Survey. I. Survey Objectives and Design by Carter et al. (2008) ApJ Supplement 176:424 June 2008. A description of the SExtractor source catalogs and recent data calibrations are provided in "The Hubble Space Telescope Advanced Camera for Surveys Coma Cluter Survey. II. Data Description and Source Catalogs" by Hammer et al. (2010) arXiv 1005:3300. * New catalogs are available for DR2.1. DR2.2 contains one data product: a Catalog of structural parameters of 8814 galaxies. Images have not changed since DR2 and catalogs since DR2.1. The data are available via anonymous ftp from archive.stsci.edu.